The founder of J. L. Mott Iron Works was Jordan Lawrence Mott (1798-1866). Jordon L. Mott was listed as a "grocer" in Longworth's New York City Directory from 1824 to 1834. In 1840 the occupation changed to "stoves," and in Doggett's directory of 1842-43 this changed to "iron foundry." The following is quoted from the History of Westchester County, New York: including Morrisania, Kings Bridge and West Farms which have been annexed to New York City, by J. Thomas Scharf, Volume 1, Part 2, Philadelphia, 1886, "Jordan Laurence Mott was born at Manhasset L. I., October 12, 1798, during a temporary residence of his parents at that place, to which they had gone on account of an epidemic of yellow fever in New York. The affluent circumstances of his father rendered his early life one of ease and leisure, and he in youth developed that inventive genius which has since made his name so widely known. At the age of fifteen he invented a machine for weaving tape, which was successfully operated, and from that time till 1853, when he retired from business, was constantly engaged in various inventions, and more than fifty patents are recorded in his name. The business reverses which overtook his father rendered it necessary for him to engage in active labor for himself, and in 1820 he commenced commercial life as a grocer. At that time cooking-stoves were a recent introduction, the fuel being wood, which was then plentiful, and Mr. Mott invented the first cooking-stove in which anthracite was burned as a fuel. The comfort and convenience caused by this invention can hardly be over-estimated and justly entitled him to the gratitude of the community. The stove-castings were at that time made at blast furnaces in Philadelphia and were very rough. Mr. Mott built a cupola furnace and made his castings smooth and beautiful. "The stoves made at his works soon became popular, and the small foundry, which was situated in the rear of his store on Water Street, in New York, was the beginning of the famous Jordon L. Mott Iron-Works, the productions of which are now sent to every country on the globe. "Mr. Mott lived to see the business which he founded on a limited scale gradually increase till it became one of the largest establishments in the country and the creations of his inventive genius have made his name a household word. During the administration of President Buchanan he was offered the position of commissioner of patents, but declined to accept. The Reformed Dutch Church at Morrisania, which he built and presented to the people, will be a lasting monument to his name. After a life of active and untiring usefulness he died May 8, 1866, and was buried in Greenwood Cemetery." The U. S. Census of 1850, non-population schedules, recorded 2 entries for Jordan L. Mott. The first was in New York City's 4th ward: "Stove Sheet Iron Tin Ware Manufactory," employing an average of 4 hands at an average monthly cost of $186. The annual product consisted of 2640 "Pipe & Stove Furniture" valued at $4,000. Materials on hand were 8 tons of iron ($810), 125 sheets of copper ($147), and 28 boxes of tin ($346). A second census entry recorded him in West Farms, Westchester County: "Iron Founder," employing an average of 40 hands at an average monthly cost of $960. Materials were 500 tons of pig iron ($11,000) and 150 tons of coal ($750). The annual product consisted of pipe valued at $14,000 and sundries valued at $20,000. The following is quoted from Zinc Sculpture in America, 1850-1950, by Carol A. Grissom: "Jordon L. Mott, Sr. (1798-1866), was a well-known personality in New York at the middle of the nineteenth century. He had invented the first stove that burned anthracite coal instead of wood. Toward the end of his life he organized an important portrait of nineteen living inventors (including himself), painted as if in the Great Hall of the U. S. Patent Office. Christian Schussele's Men of Progress (1857-62) is now in the collection of the Smithsonian Institution's National Portrait Gallery. "In 1835 Mott opened a foundry in New York to manufacture cast-iron stove fronts, and he was famous for stove castings that were 'smooth and beautiful' in contrast to the rough castings then available. The J. L. Mott Iron Works became large and successful, and it was valued at more than one million dollars in 1871. By then, the company had an extensive factory complex at Mott Haven, later to become part of the Bronx. It was under the direction of Jordan L. Mott, Jr. (1829-1915), who owned a mansion on upper Fifth Avenue where he displayed a copy of the Amazon on Horseback Attacked by a Lion in his conservatory." In 1900 the Biographical Directory of the State of New York had the following two listings: "Mott, Jordan Lawrence - Iron Manufacturer, 90 Beekman street, New York City; residence 2122 Fifth avenue. Born in New York City, Nov. 10, 1829. (Son of Jordan Lawrence Mott.) Educated at New York University ('49). (Married.) Became partner in his father's business in 1853 and succeeded to its management in 1866�" and "Mott, Jordan Lawrence, Jr. - Iron Manufacturer, 90 Beekman street, New York City; residence 17 East 47th street. (Married.) Vice-president and director J. L. Mott Iron Works; treasurer and director North American Iron Works; director Mott Haven Co. and Washington Life Insurance Co�"
"Mr. Mott was born in William Street, the city home of the family at that time, and received his early education at Irving Institution in Tarrytown. Later he attended the University of the City of New York, but left during his junior year at the age of 20 to join his father in business. His father was Jordan L Mott, the first of the name, and who founded the iron works that grew into the present company. He was an inventor, and made the first stove for burning anthracite coal. Mott Haven, on the Harlem River, received its name from the iron works he established there, and he was largely instrumental in building the town of Morrisania. "After joining his father Mr. Mott served an apprenticeship of four years, and was admitted into the business in 1853, when the J. L. Mott Iron Works was incorporated. In 1866 he took entire charge of the business, and has continued until his death. Ten years ago he removed the works from Mott Haven to Trenton, N. J." The third Jordan L. Mott died in 1932 while yachting in the Bahamas. His obituary, New York Times, 8 Jan. 1932, read in part, "Announcement was made here last night of the sudden death yesterday in Nelson Harbor, Bahamas, B. W. I., of Jordan L. Mott, former president of the J. L. Mott Iron Works, at the age of 74. His grandson, Jordan L. Mott 3d, received a cablegram stating that death was due to a sudden heart attack... Entering the family business as a young man, Mr. Mott succeeded to the presidency of the company on the death of his father in July, 1915. He retired about ten years ago..."
This ad for the J. L. Mott Iron Works dates from 1857. 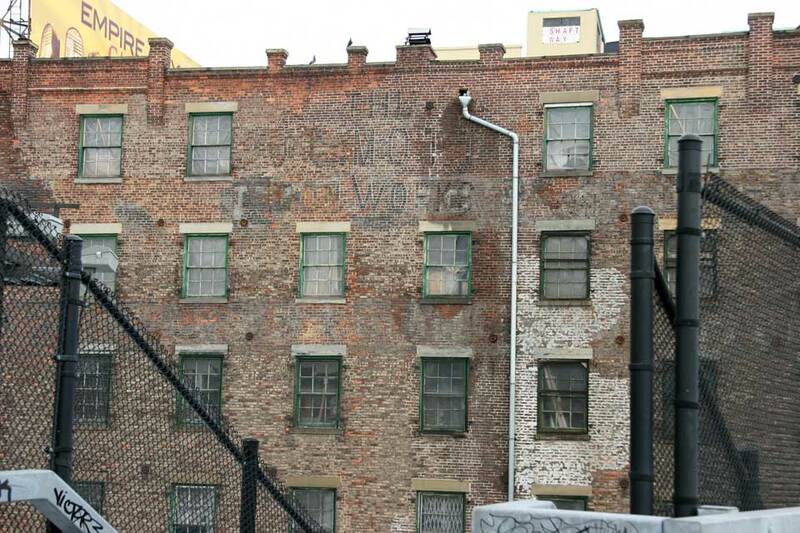 Their warehouse was located in downtown Manhattan on Water St., and the president at the time was Augustus F. Weekes. Weekes, (born ca. 1815, died March 1887) was listed in city directories as president of J. L. Mott Iron Works from 1856 to 1872. He appears in the 1860 U. S. Census living in Brooklyn, age 45, born New York, with a family consisting of a wife, a mother-in-law, 5 daughters and 1 son. He also appears in 1863 Civil War Draft Registration records age 44, merchant, born New York, living at 146 South 9th St., Brooklyn. His last entry in the U. S. Census (1880) recorded him age 67, retired, living in North Tarrytown, Westchester County, NY. On 7 July 1902 the New York Times reported on the departure of the Mott iron works from the Bronx, "Trenton, N. J., July 6. - It was announced definitely here to-day that the Jordan L. Mott Iron Works will desert the plant at Mott Haven, New York City, and move to Trenton within the next twelve months. President O. O. Bowman of the Broad Street National Bank, this city, with whom the Mott people are associated closely in a business way through the Trenton Fire Clay and Porcelain Works, said to-day that the entire plant of the Mott Company is to be transferred to Trenton as fast as the necessary buildings can be erected." This illustration of Mott ornamental iron work appeared in Sweet�s Architectural Catalogue, 1917. This ad for the J. L. Mott Iron Works appeared in Modern Hospital, vol. 18, no. 4, April 1922. By this time Mott had been in Trenton for the past twenty years and had offices in New York on Fifth Avenue. 1828 seems a bit early for Mott's establishment. City directories indicate Jordan Mott was still a grocer at that date, and did not get into the "stoves" business until around ten years later. Various iron products of J. L. Mott still exist on the streets of New York. This coal chute cover in Brooklyn Heights carries the inscription "Established 1828." This drain on Broadway in front of Trinity Church is typical of much that remains. An inoperative sidewalk drain with the Mott name is found on Mercer St. Another Mott coal chute cover is found on East 67th St. According to Elena Filipovic in The Apparently Marginal Activities of Marcel Duchamp, 2016, Duchamp's urinal, entitled Fountain, submitted to the Society of Independent Artists Exhibition in New York, 1917, "was chosen from among the lavatory supplies at J. L. Mott's ironwork and appliance showroom."